'&tv' Channel of Zee Network is latest Hindi Entertainment Channel and this channel is trying to increase his TRP as soon as Possible. 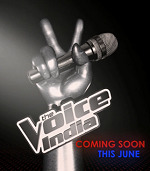 So for achieving this goal '&tv' channel is ready to Launch a New Singing Based Reality Tv Show "The Voice India" in the Upcoming month of June. 'The Voice India' is the Indian edition of the internationally acclaimed singing reality show.This reality show is being produced by Endemol. The show's judges include leading Bollywood singers Himesh Reshammiya, Mika, Shaan and Sunidhi Chauhan. 'The Voice India' reality Show is the biggest non-fiction offerings. The show takes a distinctive route in its selection process and focuses on quality of talent, which differentiates the format. For the primary edition, it's a formidable panel of coaches that includes the country's best musicians that will mentor new talent. The best thing about this show is that this show is not Judged by anyone ,this show is Judged by Famous Indian Singers and Musicians .So "The Voice India" is proved to be great platform for our young Singers. 'The Voice India' follows a format where the contestants are chosen through 'blind auditions' only on the basis of their voice and not appearance. Owned by Talpa Media, the format is touted as one of the most successful and groundbreaking vocal competitions across the globe. This reality show is ready to Launch in June,2015 . Stay Tuned with us for full timing details about this show.